Sunday football - Feathers FC v Ovenden Brown Cow FC (green). Harvey Walsh for Feathers and Calum Noakes for Ovenden. It was a good day for Brighouse sides in the top flight of the Ziggy’s Metro Cars Halifax Sunday League as both Old Pond and Top Club picked up victories. Pond won 2-1 away to beaten West Riding County Cup quarter finalists Hollins Holme thanks to a brace from Hayden Lewis. The visitors had only won once in the Premier this season and went behind in the first minute when George Bamford struck. However, Pond found their feet with man of the match Luke Sherry enjoying some good touches on the left flank. Lewis and captain Paul Taylor forced good saves from Hollins keeper Steve Butterworth and Lawrence then made a fantastic last gasp challenge to deny Bamford a second. The first chance of the second period fell to Chris Garbutt, who was denied by a flying save from Dan Barnes, before Taylor threaded a precise through ball to front man Lewis, who got his shot away quickly and found the net. Lewis and Allert might have scored before O’Callaghan tucked a lovely reverse path to Lewis and he put enough power into his shot to beat Butterworth with the aid of a deflection or two. O’Callaghan skimmed the bar and late Hollins pressure came to nothing. Pond climbed off the bottom thanks in part to Top Club’s second Premier Division victory in successive weeks, against Lee Mount. Matthew Spink’s side won 6-2 to send Mount to the bottom. Carrington’s march towards another title continued with an 8-3 win away to Ryburn United, the emphatic score-line not telling the whole story. Ryburn acquitted themselves well from the outset and took a deserved lead through John Wadsworth. The home side were unlucky not to add to their lead before Jay Carney levelled for Carrington. Carney added a second shortly after and then Jordan Coduri extended the lead further. Ryburn continued to cause the reigning champions problems and it looked to be game on again when Wadsworth doubled his tally. However, Josh Hiley restored Carrington’s two goal cushion to make it 4-2 at the interval. Carrington took full control in the second half and Carney scored twice more. Leon Hurles-Brook and Coduri added further goals before Macauley Peacock got a third for Ryburn late on. Waiters Arms consolidated their place in the top three with a 7-1 home win over one time title contenders Mount Tabor. Tabor were pinned back from the start with Billy Grogan prompting for the home side and Waiters soon took the lead when good control from Kev Talbot allowed speedy winger Marco Romano to slot home. Romano then played in Grogan, who finished smartly. An own goal added to Tabor’s problems but they pulled a goal back right on half time when Adam Helliwell set up Andy Bottomley, who finished well into the corner. James Grimble and top scorer Lee Wood entered the fray and quickly combined to give Carl Maguire a tap in. Maguire then turned provided for Wood to make it 5-1, rifiling past the stranded George Williams in the Tabor goal. A smart header from Talbot and another from Maguire completed the scoring. Division One leaders Feathers beat Ovenden BC 4-0 and second-placed Beehive and Crosskeys maintained their promotion drive with a 5-0 win over Fountain Head. Third-placed Queen Hotel started the day leading Barge only on goal difference but a 3-2 win away to those rivals leaves them well placed for a top three finish with games in hand. Barge led 2-0 through Graham Pugh and Sam Halstead but they flagged in the last 20 minutes. At the other end of the table, Royd Club remain rooted to the bottom after a 10-2 defeat away to Bradshaw. King Cross Park moved a step closer to the Division Two title, and confirmed their place in Division One next year, with a 10-1 win over Ovenden Phoenix. It took just two minutes for Evan Robinson to open the scoring, capitalising on a defensive mix-up to finish from close range. Tom Pierson doubled the advantage with a header from a Si Ward free kick but Phoenix’s best player James Bradley led a blistering counter attack before squaring for Patrick Hellowell to slide home. Any hope of a comeback was dashed almost immediately, when Nathan Drake rose highest to crash home a header. Jonny Pickles hit an unstoppable half volley from 30 yards and captain Si Ward and Robinson made it 6-1 at the break. Phoenix were much improved in the second half, with some resilient defending until the hour mark, when full back Matthew Robinson was felled and usual spot kick taker Ward allowed Robinson to complete his hat-trick. Andy Hodson-Walker and Alex Rogers completed the scoring. St Columbas were excellent against Halifax Rangers at Savile Park and the second-placed side needed a late goal to salvage a 2-2 draw. An even first half sprung to life when James Forsyth fired home from a corner to put Rangers ahead. Andy Bowe’s long throws helped put Saints on the back foot but it was different after the break with Josh Miller, Jordan Winter and Tom Howse looking dangerous for the visitors. After good build-up play, Howse stroked the ball home from inside the area, and Saints went ahead when Winter shot into the corner from 20 yards after spotting the keeper out of position. Saints held firm, with centre backs Arron Ashworth and Kev O’Neill in command, but with a couple of minutes to go, substitute Aiden Hill swivelled and fired home from a corner to cue celebrations from the Rangers contingent. 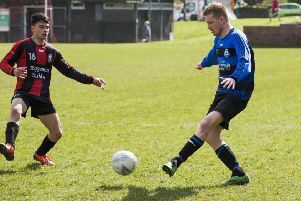 Top Club Reserves climbed to seventh with a 4-2 win against North Bridge Reserves. Halifax Hammers booked a trip to Ryburn Valley in the semi-finals of the Senior Cup on April 10 with a 9-0 win over Division One side North Bridge. Their scorers were Matty Waller 2, Mohammed Ozair 2, Shiraz Khan 2, Jasim Saleh, Sameer Ahmed and Lamin Gitteh.